Concept Sketchs for a 'big daddy' water predator - Name that creature! Dwelvers Forum › Dwelvers › Community Creations › Image - Concept Sketchs for a 'big daddy' water predator - Name that creature! Poll: What should this Hybrid Creature be named? Image Concept Sketchs for a 'big daddy' water predator - Name that creature! If you have any feed back, or suggestions at all on what you imagine this fellah should do, act, feel, or look. Please, speak up! Let's make a monster together, shall we? Okay, so.. I blame Mello Tonin for this. Though, in reality, it's not really his fault. 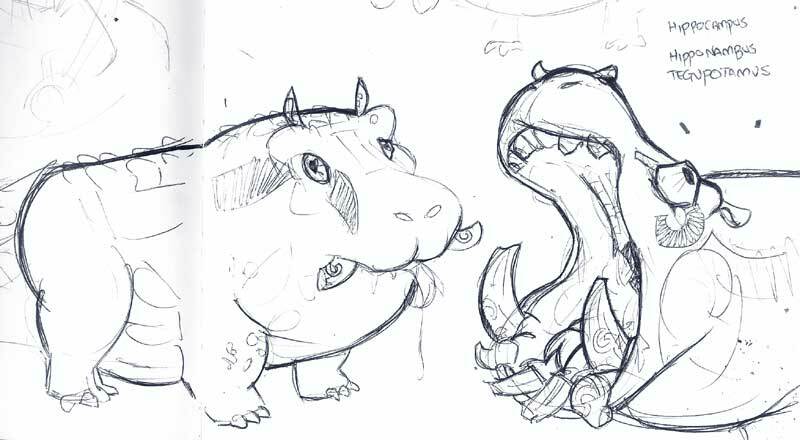 For some reason he triggered 'hippo' in my mind after remarking about hybrid stuff, and I haven't been able to get the idea of a hippo hybrid out of my mind. Now, you might wonder why I'm posting it here, instead of in the 'new concept' section. Well, truthfully, it's because, while I consider myself a good 'idea man', I sometimes need to flesh ideas out before I should really state anything about them. So, I figured it might be better to throw up some concepts, state a loose fitting description of some things I'm thinking on the creature in question; and sort of let everyone discuss it and try and hammer out the details before I write up an official 'pitch' to be set upon the great wall of suggestions. So without further adduce. Allow me to introduce you to my 'big daddy' water predator. It doesn't have a name at the moment, well, it has about 5 different names (which is another thing I want feed back on), but I ca well you what it is. This creature is a hybrid style water predator. It is a mix between a Hippopotamus, which some of you might not now, kills more humans every year than any other animal in the world (Males are extremely territorial and have tusks large enough to bite boats in half); and an Argentine Black and White Tegu which is a very nasty, gluttonous lizard; with some other lizard stuff liberties taken. So, here's some roughs.. Which kind of look ick because my scanner is being dorky. Sort of feeling out how to mix the two. More feeling it out. This open mouth shot has it drawn with Chameleon like eyes. While, I'm having trouble deciding if I'd want that or not. Chameleon eyes are rather cool, and can move independently of one another. Would be neat to animate, I think. And this is the last one I did, it doesn't have chameleon eyes, but rather more.. I'm not sure what sort of reptile/ amphibian that's from, honestly. But I'm digging on this shape a little more, and I'm taking more and more liberties with it. I've added some horns on over the eyes, and some ridges on the brow. It's starting to feel more like a hybrid now, and less like a hippo with scales and a fancy pattern. Now as for how he works and what role he plays, I've not established to much. He will live in ponds underground and attack creatures, that much is certain. He will also be rather strong, and particularly devastating with his 'swallow whole' or 'swallow dead ability', meaning whatever he slays can not be dragged back by imps to be healed, nor can their armor or weapons be reclaimed. I was also thinking he would have a 'digest time', which would be a sort of double edged sword for the player encountering it. On the one hand, if slayn swiftly, the creatures he's eaten can be saved, as well as their loot. On the down side, however, this will lock those consumed creatures in a state of both being alive and dead, meaning the dark mother will still recognize them as 'living' and not replace them; meaning if he manages to swallow a large section of your forces, there will not be rapid spawning level ones to replace them to fill out your ranks and run distraction to keep it's attention off your remaining important creatures. He is particularly found of Fishmen, Piggehs and Imps, and is nearly bottomless when eating, having either no, or a large limit of units he can consume, and with the delayed 'digest time' this means he can cripple production chains with rather devastating results. I am also considering that, if Croclodyes are included in the game, he will not attack them unless attack by them first. I very much imagine him to be a sacred creature to them, and some how, they have formed a sort of symbolic relationship. Right now, I have a hand full of names I'm considering. 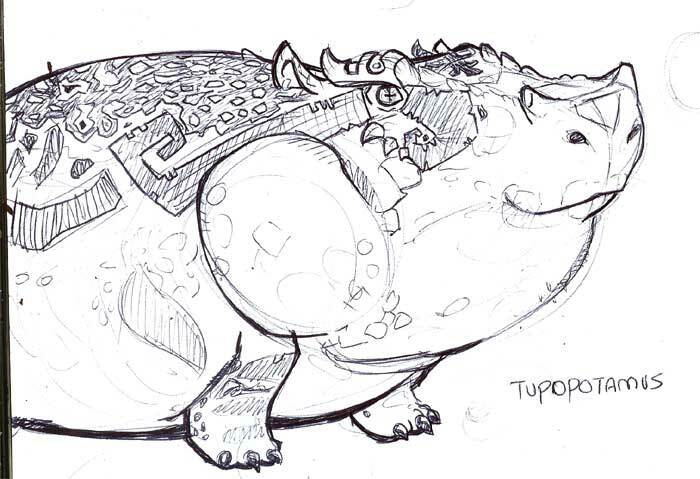 4: Hipponambis - This is both a paraody of 'Hippocampus', an established creature in lore, and 'Tupinambis', which means giant tegu. 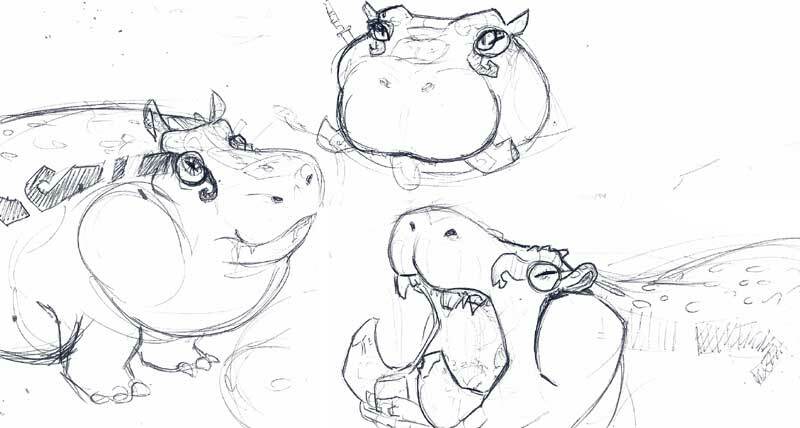 5: Pythopotamus - A mix of 'Python' and 'Hippopotamus'. While technically the design is not based around being mixed with a snake, the 'swallow whole' ability is synonymous with snakes more than lizards to the common public. And it's still very much a reptile. Also, while based on a tegu, the concept of it being mixed with a snake is not to far out there. Post reserved for update log. There are some good points about how this creature would operate, but unfortunately I don't have much time to add to this at the moment. Had to look up what a Argentine Black and White Tegu was, and apparently they make great pets, so sayeth the Wikipedia. I always found Savannah Monitors were much tamer than Tegu if your gonna go the carnivorous lizard route. Which, honestly, I always found to be messy, violent creatures. But Bearded Dragons are still the best starters, Iguanas also, if you have the space it needs. Thanks for at least replying. Honestly I can't tell if people just aren't keen on the lizard hippo fellah here, or if this forum was just a bad choice <.< I've gotten about 50 hits, So, I think people just aren't fans of him. He is a little 'outside the box' I suppose. Hm, well, I suppose I'll go back to focusing on my lady of pain idea thingies.